From a chat we had a while ago, to it actually being on the shelf ‘A Visual Journey‘, a book by Ed and myself came out this month in the US. It’s been out since October in the UK and has already become a Times Bestseller. 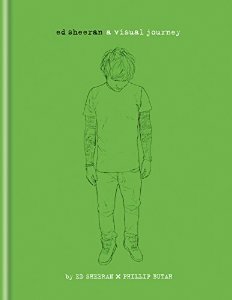 People keep calling it an autobiography but it isn’t, it’s more of a retrospective of Eds career so far told through my work. Putting the book together was no easy task but the other day I went to WHSmith and there it was. I felt weird seeing it there sitting amongst all the other titles but that bright green can’t be missed. Much like Eds ‘X‘ album that I also worked on, the fastest selling album of 2014..just saying. The book signing was colossal, we signed 1,500 books in one sitting. Ed wrote personalised messages in each one. If you couldn’t make it down I’ve posted a video so you get a taste of the event. So it’s been I busy time, I don’t usually celebrate thanksgiving in England but this year I think I might.